"Treat it like it's yours and one day it will be" -- this is the working motto behind the way Thomas Keller the businessman, keeps his restaurants successful and in loving, capable hands. His respected name, while well known in the culinary world and public at large, tends to be nearly invisible on his restaurants, and that is most certainly by design. When you hear about French Laundry, Bouchon, and Per Se, you don't need to see his name in lights because the food and the experience speaks for itself, and all-around éclat is the rare currency with which they navigate the restaurant world. That fortune is as a result of Thomas Keller the chef, who has such a clear understanding over ingredients and the importance of complimenting fresh flavors, never straying from the food's sincerity. It is that earnest pleasure from the synthesis of quality ingredients that Keller discussed when he visited Seattle to promote his new book of recipes based off his latest restaurant, Ad Hoc. 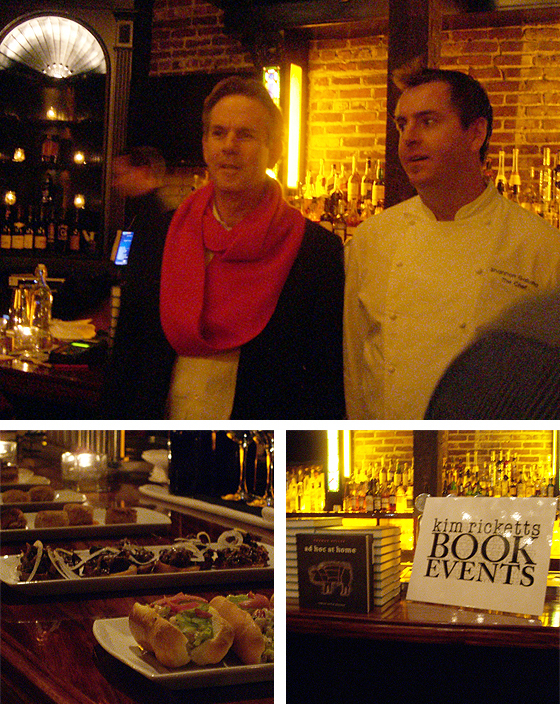 A group of diners, well-wishers and media gathered at Bastille, to listen to the wisdom of Sir Thomas, nibble on some samplings from Ad Hoc's recipe book, and experience the foodie fangeek moment of saying they got to talk to Thomas Keller. Don't lie -- I know I couldn't have been the only one totally giddy to be there. Organized by Kim Ricketts Book Events, they couldn't have picked a more ideal location: beautifully detailed French bistro surroundings and Bastille's executive chef Shannon Galusha worked at French Laundry for three years. 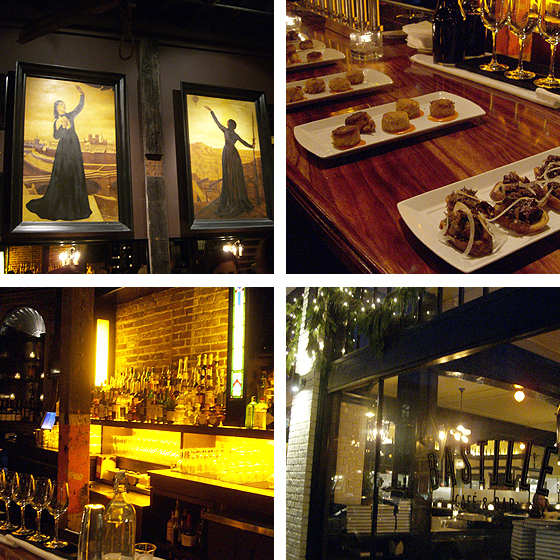 The warm glow of candles and dimmed lighting cast a golden glow throughout the restaurant and private bar area where the media event was being held. Plates of warm, comforting food were laid out for people to sample, all made from Ad Hoc's menu. Of all the appetizers, the rich, deeply-flavored oxtail and mushroom crostini was probably my favorite item, and then the savory crab cakes. Nestled among Keller's existing family of Yountville, California restaurants, Ad Hoc is a more casual dining experience, offering a prix fixe menu of flavors designed to evoke memories of meals at home, amongst loved ones. Ad Hoc simply means provisional or temporary, which was what Thomas Keller's family-style restaurant was meant to be, but it settled so nicely into the dining groove of the neighborhood that it became a permanent resident. The food is distinctly comfort-based, with all-American roots. Keller said he had always wanted to do a hamburger restaurant. It seems like an odd thing for someone with such a prestigious career to move towards something as humble as a quarter pounder, but he spoke of a collective food memory that everyone has. The meals we all grew up on were less likely to be gourmet, more like a family dinner that was put together with simple comforts and shared. It was less about the food and more about the way a meal encouraged interaction with its diners. The process of choosing something on a menu is private, but when the whole meal is laid out for everyone to experience, everyone becomes involved. Keller admits he didn't experience the traditional family dining experience, that his brothers were the ones who took care of meals to notably mixed results, but he clearly understands the function of the family table, and Ad Hoc is a reminder that food isn't always about the prestige of luxury ingredients, simply the immeasurable value of something made with earnest skill. To the point of Keller's fatherly quote, he runs his restaurants in a parental way, willingly passing on the stewardship to others, once they've proven they can run the business successfully. His corporate and cooking philosophies have a similar theme of self-sufficiency. He spoke of a reliance on culinary skills, that it was crucial to have a thorough understanding of methods and ingredients. He implied that recipes are a bit of a double-edged sword; they can guide people towards recreating a dish, but it doesn't always encourage people to step outside of the printed words and gain a deeper knowledge of how the dish works and why it is successful. The topics of home comforts and independence in the kitchen led to a question that I asked Keller when he was signing books. Anthony Bourdain calls it his Death Row Meal, which is to say, it's the thing you crave if you know it is your last meal to enjoy. Inevitably, even the most famous of chefs always name something their mother used to cook for them or some simple, humble dish that no one would have guessed in a hundred years. I wanted to know what Keller ate when he was in the comfort of his own home, when he can tuck away his celebrity and he only needs to satisfy his own palate. I'm sure it was an idiot question to ask -- he only lives in the same city with all his restaurants as neighbors -- but this wasn't about restaurant dining. Our sense memory comes from a place before we understand what "gourmet" means, and whether we are aware of it or not, we keep those early memories of food close to our hearts, and stomachs. If one truly loves food, it is a blind affection that is not swayed by status, cost or other outside perceptions. 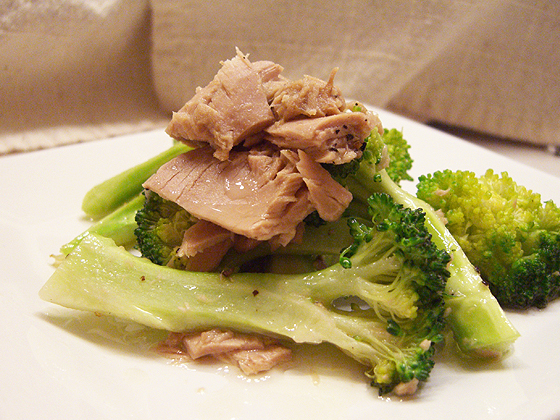 Thomas Keller said his go-to pantry cooking is often some fresh broccoli cooked up with canned tuna, drizzled with olive oil. Incredibly simple, with basic staple ingredients found in most homes. It wasn't until stepping into his food memory shoes and making this same combination in our kitchen that I wondered if some of this was from those childhood days of his brothers cooking for the family. The warmed tuna and greens were reminiscent of the old beloved standby, tuna noodle casserole. The quick meal's simplicity and efficiency spoke to the needs of a busy adult, but the flavor made me think that it spoke to the child finding comfort in a home-cooked meal with family. His answer was perfect, even at the risk of myself looking like a total moron -- I really think he was irritated at me for asking it! But his off-the-cuff answer completely supported the mentality behind what Ad Hoc is, and what its recipes seek to do for people inspired by them: rediscover the family meal, and do so with respect to ingredients and methodology. Yet another Christmas present come early for the Prime, having the chance to see Thomas Keller and purchasing a copy of Ad Hoc as a gift for myself. I'm hoping the book is a way to give the gift of a good meal to my loved ones in the near future, so that we may continue that philosophy of food with friends and family. Many thanks to Kim Ricketts Book Events, the fantastic team at Bastille, and Lissa Gruman of Gruman & Nicoll for extending the invitation to the media event. I look forward to future events with guest chefs and food authors visiting Seattle and sharing their thoughts and words with us. Cheers! Ooooh you got to see Thomas Keller?!?!?! SOOO jealous. How awesome for you. I need to get off my duff and order his book. Great write-up, and what a fabulous opportunity! I feel like everywhere I look/read, someone is posting something wonderful about this cookbook...I'll have to pick it up and try it out myself. Fantastic post - as always! I am so glad you got to meet Thomas Keller. He's a lovable genius... :) I got to meet him at The French Laundry a few years back and never forgot it... Ordering Ad Hoc now! I have to admit I am salivating a little bit after your blog. Everything looked so delicious and it is a rare book that can make a pig that has been marked with a surgical pen look appetizing. Sounds like you had an amazing time! Wonderful that you got to meet Thomas Keller! Enjoy the cookbook! I love your shot of broccoli and tuna! what a wonderful experience, I'm so glad you shared it. 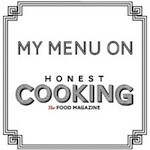 The simplest food is the best, proven again by your intense article. 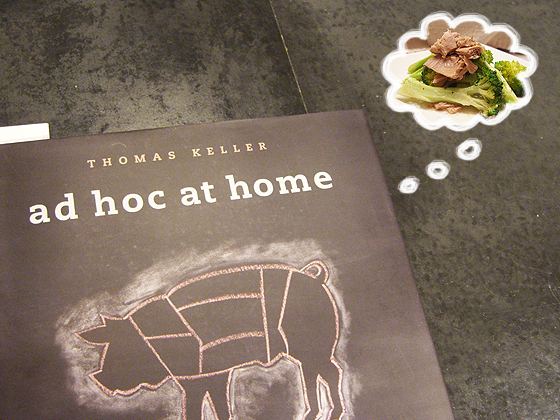 I have a dream of being trained by Chef Thomas Keller. Glad that you were able to meet him and I'm sure it's memorable experience. I am so sorry I missed Thomas Keller here in Seattle. I bought his book just to see what the hype was all about and it has quickly become one of my favs...and I have blogged about his genius as well. Thanks for sharing such a wonderful experience!